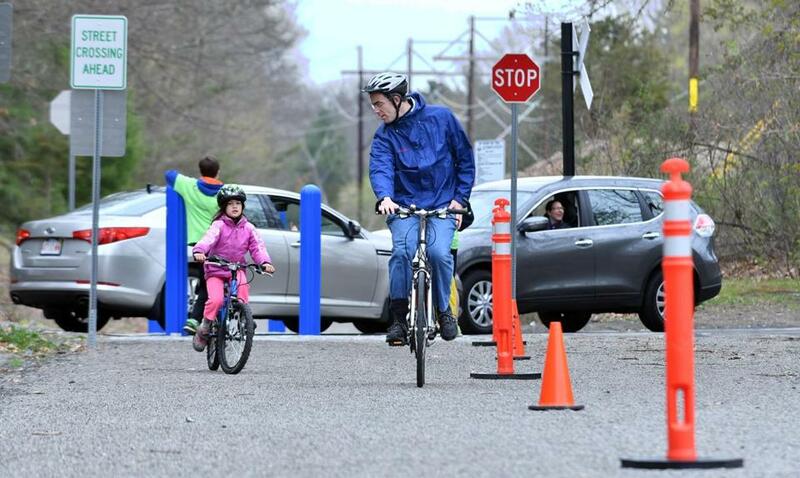 Gershon Gacs and his daughter, Zoe, rode to the grand opening Sunday for a new rail trail in Needham. A controversial plan to turn an abandoned rail bed into a recreational trail in Dover is slowly moving forward. Meanwhile, a nearby rail trail in Needham, which some hope will eventually connect to the Doverpath, officially opened last weekend. Residents turned out in droves at the Dover Town Meeting on Monday night and authorized the Board of Selectmen to enter into negotiations with the property owner — the MBTA — to lease a 2.7-mile stretch of land for 99 years. The vote was 475 to 334. “We’ve been at this for three years so this was a big deal for us,’’ said Alan Moss, who is on the board of directors for the Friends of Dover Greenway. It’s not a done deal, however. A final agreement will need approval at a later Town Meeting. Although some Dover residents would like to connect the trail to Needham and Medfield as part of the Bay Colony Rail Trail project, Moss said there are no plans to do so in the near future. He said connecting the trails is even more controversial and would require a new bridge over the Charles River. Tad Staley, president of the Bay Colony Rail Trail Association, said connecting Needham, Dover, and Medfield was the initial goal when he formed the group but he realizes that it isn’t feasible right now. He said he’s happy different parts continue to move forward. Needham’s 1.7-mile stretched officially opened May 1 and so far it’s been a huge success, Staley said. “The great thing about this project is that it’s multi-generational,’’ Staley said. Staley said there is still work to be done, though. He said the group has agreed to reimburse abutters for fencing and privacy screens, for example, and they are working on more parking at the trail heads. Dover’s greenway would go from Springdale Avenue in the center of town to Hunt Drive. Conversion of the existing rail line would involve removal of the rails and ties, and covering the rail bed with a surface of stone dust. This surface would be suitable for walking, jogging, bikes with regular tires and cross-country skiing in the winter. But not everyone is on favor of the project. A group of residents formed Be True to Dover, to oppose the plan. Opponents have raised concerns about the environmental impact, privacy for abutters, long-term cost of maintenance, liability, unleashed dogs, and an influx of high-speed bikes. Moss said his group has worked hard over the past few months to help answer questions about the rail trail project and was happy with the outcome Monday night. “The community spoke last night and said they want it to happen so we are hopeful it won’t get dragged down in any way,’’ Moss said in an interview Tuesday. The vote authorized the Board of Selectmen to enter into negotiations with the MBTA but does not mandate an agreement, Moss said. Selectmen Chairman Jim Dawley said he will propose putting together a meeting with different groups in town to come up with questions and negotiating points in the lease. Once that’s done, the board will start discussions with the MBTA to put together a document, which Dawley said will go back before residents for a final vote. “The board has promised the town that once we negotiate, we would go back to Town Meeting,’’ he said. If the town reaches an agreement with the MBTA, Moss said his group would begin fundraising efforts and continue to work with opponents. “We’re trying to reach out to them to move forward and bring them into the process,’’ he said. The group has committed to privately raising all the funds needed to construct and partially maintain the rail trail, a total of about $1 million. He said the whole process from fundraising to construction could take two to three years. He said the group has also offered to raise money to help abutters with fencing and vegetation. “We’re optimistic that there is a lot of interest from donors in town willing to make a big investment for this purpose,’’ he said. 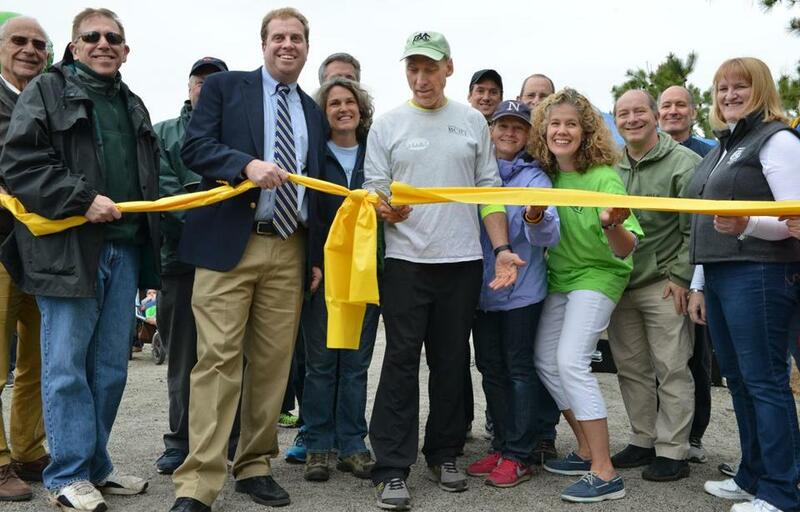 Tad Staley (center) who lead the effort for the Bay Colony Rail Trail, was surrounded by those who helped bring the idea to fruition as he cut the ribbon at the grand opening event in Needham.